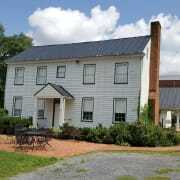 The Warren Heritage Society, Inc. is the Front Royal/Warren County community's historical society, museum of Front Royal and Warren County, VA history, and archives. Established as a non-profit organization in 1971, we strive to bring local history to life through programs, events and exhibits. Here at the Warren Heritage Society, we are working to save our local history and expand our programs and exhibits. We can only do this with many hands to help! You can be a part of your local history by giving your time and knowledge to our society! Would you recommend WARREN HERITAGE SOCIETY INC?